Specs: Replicas of Philippine tourist landmarks, cultural heritage, museums, souvenir shopping.
. Philtranco. Airconditioned buses bound to Clark International Airport/Diosdado Macapagal International Airport have terminals at SM Megamall Bldg A, near ADB (P300) and EDSA Pasay (P350). Buses have the Airasia airline logo on them. Visit their website for updated trip schedules.
. Partas. Bus terminals are located in Pasay and Cubao, both along EDSA. They have daily trips bound for DMIA.
. Philippine Rabbit. Take the trip to Angeles from their Recto bus terminal (P115, airconditioned). Get off at Angeles then just ride a jeep to Clark.
. Buses bound to the North. Many buses bound to the North (i.e. Baguio, Pangasinan, Tarlac) have stop-overs in Dau, Mabalacat, Pampanga. You can take these buses which usually have terminals along EDSA (Five Star, Victory Liner, Genesis). Alight at Dau and exit the bus terminal. From the main road, you will find jeepneys that will take you to Clark.
. You can always take a taxi from Dau and Angeles Terminals to Clark. There are also taxis inside Clark to get you around, but these cabs don’t follow regular cab fares. Some people say they are chared P150 to P350 just for a 5-kilometer ride.
. To get to Clark Special Economic Zone by car, take the North Luzon Expressway and exit at Dau, Mabalacat, Pampanga. Make a left turn going to Angeles City, then make a right turn to Clark. Another way is to Take the Subic-Clark-Tarlac Expressway from Dau. It is about a 2-kilometer drive, away from the Mabalacat town proper traffic. Exit at Clark North. You won’t miss Nayong Pilipino, it is just beside the big Expo Pilipino tent.
. Taxis and jeepneys (2 routes) are available inside the Freeport zone. To go to Nayong Pilipino from the Main gate, take the route 1 jeepney (the ones bound for the duty free shops). Alight at Parkson’s Duty Free Shop and wait for a Nayong Pilipino shuttle to pick you up. You may contact these numbers for trip schedule inquiries: +6345-4361718 / 0917-5150300 / 0920-9829647 / 0920-2636485.
. Nayong Pilipino used to be located in Pasay City, just stone’s throw away from Ninoy Aquino International Airport (NAIA). That large patch of land is now partially used for airport needs. The park re-opened in Clark, Pampanga on 2007.
. Mass service is held at the Barasoain Church replica every Sunday at 10:00AM.
. The park features cultural shows and presentations (i.e. dances, dramas, stage performances) throughout the year.
. Entrance fee is P30 for adults; P20 for children.
. Parking fee inside the park is P30 for cars and P50 for coasters. Parking is free outside the park.
. Nipa hut lodges and cottages can be rented for a full barrio experience. Rates start at P2000 per night.
. Picnic tables are sprawled all over the park for rent. Rates range from P150-P400, depending on the size of the table. Feel free to bring food and drinks inside the park. I haven’t checked if alcoholic drinks are allowed, though. There is also a restaurant inside the park, where you can order food.
. Indoor halls and outdoor areas can be rented for functions, seminars and other occasions.
. Restrooms are available, of course.
. Souvenir shops and sari-sari stores are dotted in the park. They sell snacks, handmade native goods and furniture.
. There is always the option to hire a van for this trip as a private car makes it easier to go around Clark.
. For other activities in Clark, you can visit Fontana, Montevista in Mimosa or Stotsenberg Leisure Parks and Casino. All of them offer hotel accommodations.
. Other hotels you can check out are: Holiday Inn, Royal Hotel and the leisure parks mentioned above.
. Duty Free shops are mostly found at C. M. Recto Highway.
. For non-duty free shopping, head to SM City Clark located near the main gate.
. Some extreme activities in Clark include sky diving, off-road driving, Mt. Pinatubo trek or aerial tour. 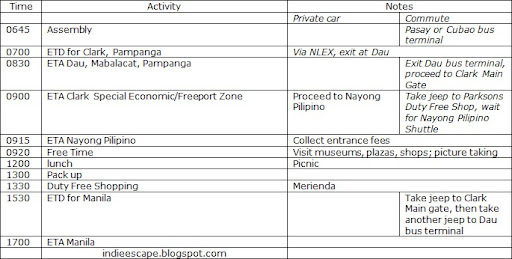 Itinerary and expenses recorded on February 2010.
cool, maisama ka nga sa blogroll ko. astig rockin' mommas na pala tayo pareho! akyat tayo bundok someday with our kids, haha! we are up the mountain as soon as my little one learns to walk! haha! OPEN PO BA ANG NAYON KAHIT HOLIDAYS LIKE JAN 23? magkano po ba entrance fee sa nayong pilipino ??? May shuttle bus po sa loob?or tour with tourist guide?